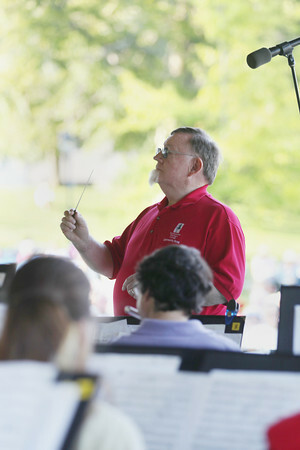 John Beery directs the Northwestern Michigan College (NMC) Summer Community Band on what he plans to be his last night directing the band Thursday, August 1, 2013 during the Concert on the Lawn at the Grand Traverse Pavilions. Beery has directed the band for 16 years and has directed bands for 50 years. Concert on the Lawn is scheduled to take place every Thursday (subject to change due to weather) at 7:00 p.m. through August 29 at the Grand Traverse Pavilions.